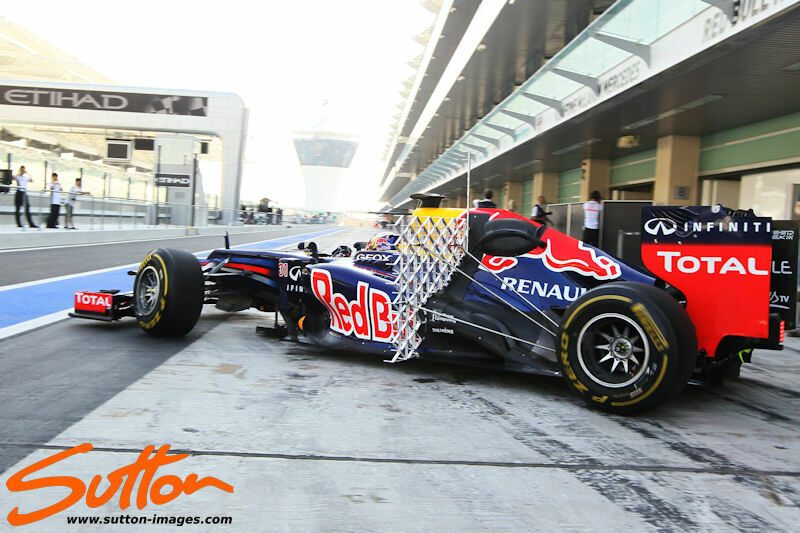 Whilst some of the teams elected to carry out their Young Drivers Tests earlier in the season we have Red Bull, McLaren, Lotus, Sauber, Toro Rosso & Caterham all taking part in a 3 day test after the Abu Dhabi GP. Although the Test carries the 'Young Drivers' title teams can use their experienced testers behind the wheel as long as they haven't competed in a GP weekend. This is why we find Gary Paffett (31) and Nicolas Prost (31) behind the wheel of the McLaren and Lotus respectively. 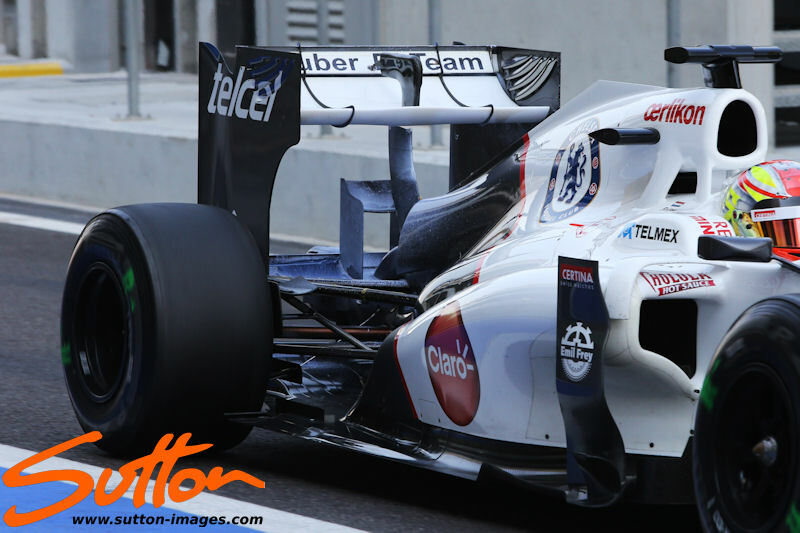 These drivers are used due to their technical nous and relative time spent in the simulator. Meanwhile Red Bull, Sauber, Toro Rosso & Caterham (latterly followed by McLaren with Magnussen) are happy to try out the new breed of drivers. The test days provide not only the opportunity to assess future talent but also offers the teams time to look at setups and aerodynamic components that may not be able to be covered in the usual Free Practice programme. In Sauber's assault towards Mercedes for fourth in the constructors it's been important that the team score regular points and so less risk is taken in testing new components throughout their Free Practice time. 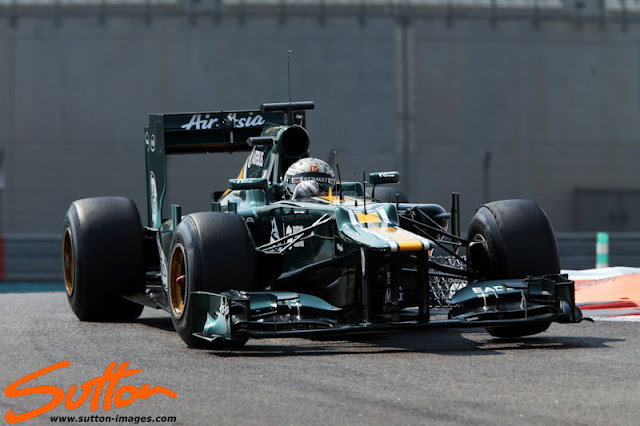 The team decided to debut their own version of a DRD (Drag Reduction Device) with Frijns on the first day of testing in Abu Dhabi to assess the devices potential for integration into their 2013 challenger. Unlike the Mercedes & Lotus DRD's Sauber haven't added inlets around the roll hoop but instead it would seem two periscope ducts have appeared on top on the bulkhead. (Credit @F1Talks) It seems Sauber may be using these 2 ducts to feed the airflow channel encased within the Engine Cover that leads to the Periscope. 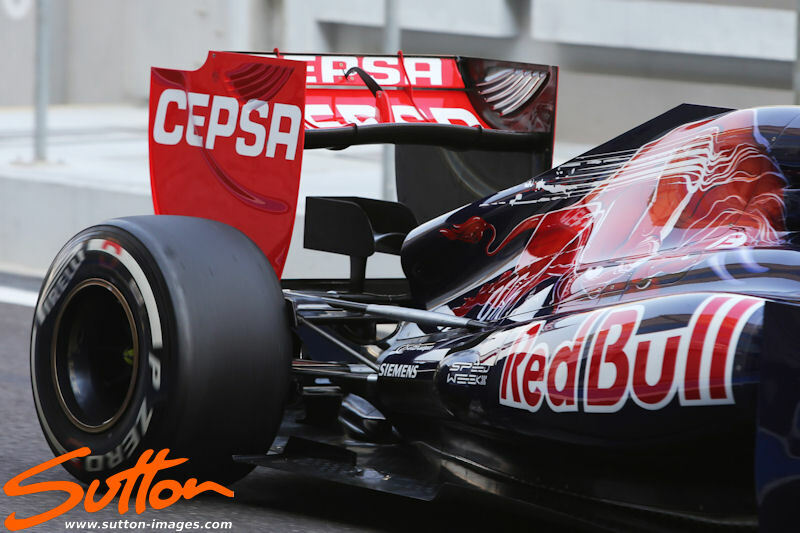 Red Bull have the impressive Antonio Felix Da Costa behind the wheel of the RB8 for the first 2 days of the test. Da Costa, I believe could be the next big name to break through as part of the Red Bull young driver programme and think it could happen as early as late next season if either of the Toro Rosso drivers fail to impress. The young Portuguese driver who has showed his talents in both GP3 and WSR this season completed the most laps on day 1 racking up 79 laps in the RB8. 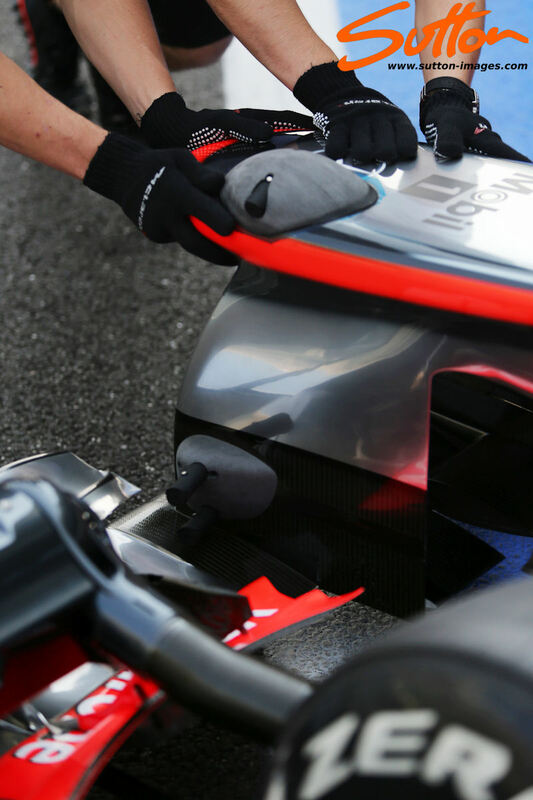 His fastest lap was merely 0.066 from the fastest lap of the day recorded by Magnussen in the MP4-27 but as we can see from the pictures below the team were using a Pitot Tube Test Device on the car for some of his running. Giedo Van Der Garde piloted the CT-01 on Day 1 with the team continuing to evaluate parts taken to Abu Dhabi but seemingly didn't work as planned. 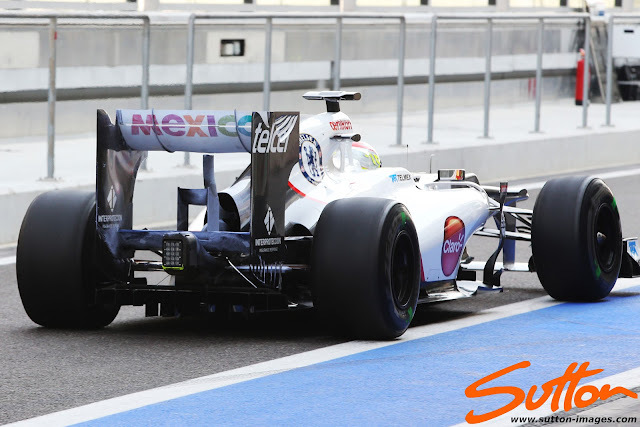 In the pic below we can see the team using a test rig in front of the Sidepod to evaluate the airflow. McLaren ran 2 driver's in their day 1 lineup both of which have already been mentioned, unlike some of the other teams it would appear that McLaren were simply looking to establish track time on day 1 with both Paffett and Magnussen covering 84 laps combined. They did however use their diffuser test rig during some of that test phase along with their Front Nose/Wing test rig. Lotus also used a test rig that attached above the diffuser in the gap between the Wheel & Rear Wing Endplates to assess their new 'Coanda' Style exhaust. In my humble opinion it is clearly illegal as the nose cone does not need to be tested to see that it is not rigid, what is obvious doesn't need to be proved! The post you written is very good and it entails many useful information for me about driving. I am happy to find your great way of writing the post. Now you make it easy for me to understand and implement the concept.